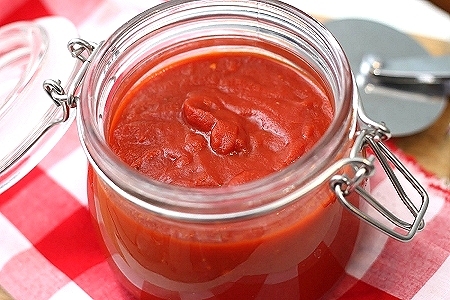 I’m embarrassed to admit it, but in the past I’d always bought my pizza sauce in a jar. I had tried a couple of times to make a version at home, but it always tended to turn out a bit watery. A couple of weeks ago, the good people at Red Pack offered to send me an assortment of their products. While I love fresh tomatoes with all of my heart, a cook always needs a stash of good quality canned tomatoes in their pantry. I’ve long been a fan of Red Pack products, ever since Cook’s Illustrated named their canned whole tomatoes #1 in it’s category. Needless to say, I was much obliged! The first thing I made when my package arrived was this pizza sauce. It is definitely a winner! It only takes 5 minutes, and the flavor is unparalleled. I used a can of pureed tomatoes, which I think is the key. Before I had used diced tomatoes, and pureed them myself…which, is what I think what led to the water-logged sauce. Less water content from the “get go” is a good thing. I add a bit of chili pepper flakes to my sauce, as we like a little kick of heat. This makes enough for 2-3 large pizzas, depending on how saucy you like your pies. It’s also a great simple tomato sauce for something like meatballs. Thanks to Red Pack, I have a lovely canned tomato assortment to pass along to one of my lucky readers! Who couldn’t use some staples for the winter months ahead? Read on for the fine print. Heat olive oil in saucepan over medium heat. Add garlic and saute until fragrant, about 1 minute. Add remaining ingredients and bring to a boil. Reduce heat and simmer for 5 minutes. Remove from heat and store in airtight container in refrigerator for up to 2 weeks. – To enter, leave a comment answering this question: What is your favorite way to use canned tomatoes? – One entry per person. The winner will be chosen by a random number generator. – Must leave a valid email address with your entry. – Giveaway is open until Wednesday 12/21 at 10 pm EST. I use canned tomatoes in my marinara sauce. It turns out much better. I love making spaghetti sauce from whole san marzanos! I use canned tomatoes to make Shrimp Fra Diavolo. It’s quite tasty. Our favorite way to use canned tomatoes is with fresh herbs from our garden (or the ones we have dried) to make Jimmy’s wonderful spaghetti sauce and he always makes extra so that we also can use it as a pizza sauce. The next time we make it I will bring a jar for you to try. Oh, and I am not bribing you. ha ha. I use canned tomatoes in my marinara sauce and lots of other dishes. I always have some on the shelf! I love using canned tomatoes in my chilli, stewed, diced and fire roasted! Having a good variety of canned adds nice texture. Nothing better than a nice bowl of chilli on a winters day! I love using canned tomatoes to make homemade black bean and corn salsa. It is always a hit! My latest favorite way to use canned tomatoes is to make salsa, but I use them all the time for many different recipes! Canned tomatoes for pasta/pizza sauce! So handy in the northern climates when fresh tomatoes aren’t always available. canned tomatoes go great in everything 🙂 soups, pastas, pizzas! the possibilities are endless! I add lots of seasonings and serve it with pasta. I like to change it up too…sometimes spicy, sometimes lots of garlic, sometimes fresh basil. I love to use canned tomatoes in my soup and chili recipes. I’m a recent convert to homemade pizza sauce, as well! I used to always buy the jarred stuff because it was convenient, but now that I’ve started making my own sauce…well, there’s just no way I can ever go back! Nice recipe 🙂 I’ll have to try the crushed pepper trick! OH! And I just realized this was for a giveaway (saw you on tastespotting!) but i love using canned tomatoes for big pots of chili! I love using it in my taco soup!